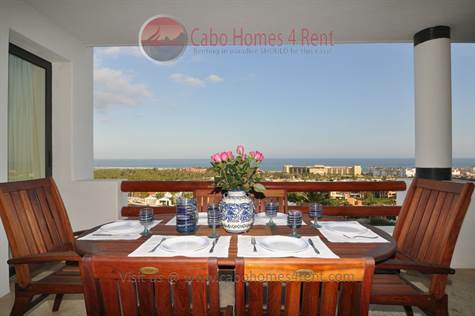 Alegranza, San Jose del Cabo - From its hilltop location, Alegranza dominates San Jose Bay from Punta Gorda to Palmilla, offering you magnificent views to the Sea of Cortez, golf fairways, the estuary and the desert. Alegranza is conveniently located within walking distance to the beach, golf course and the historic downtown, where you will find the best shopping and dining in Los Cabos. Travel time to the San Jose del Cabo international airport is a mere 12 minutes. This incredible 2 bed, 2 bath luxury condo boasts a spacious 2,000 sq.ft. of open floor plan living spaces including a spectacular covered ocean view terrace for enjoying San Jose's famed sunsets! Elegantly furnished and appointed with refined contemporary Mexican decor, your new home in paradise is offered as "move-in ready", coming complete with linens & a fully equipped kitchen. Enjoy the ocean breeze from your outdoor dining area or entertain while you cook with your guests seated @ the sleek granite dining bar. This condo boasts bright & airy bedrooms, fine finishes throughout, stainless steel appliances, a spectacular master ensuite bathroom, washer/dryer and elevator! Resort amenities include: Swimming & lap pools, Jacuzzis, health & fitness center, tennis court, golf practice facility, high speed internet, 24 hour security gate, palapa bar, bbq grill, firepits, purified water (2 carbon & 1 ultraviolet), water tanks, backup generator and sound & temperature isolation technology used on the ceilings and walls! Resort services include: Full concierge service, transportation from the airport, massage and manicure services, maid service, home chef, grocery delivery, vehicle setup, utility management and bill management. Available immediately on a 12 month contract. No pets. 1 month damage deposit due @ signing, 1st months rent and pagare for last months rent due @ occupancy. HOA dues & annual taxes included in rent. Tenant responsible for all other utilities.